We love this gorgeous cake. The three tiers each feature a different shade of blue and it gives it an elegant ombre look. The beautiful white bloom as the cake topper is the perfect addition. Anything else as a cake topper would be too much for this cake. 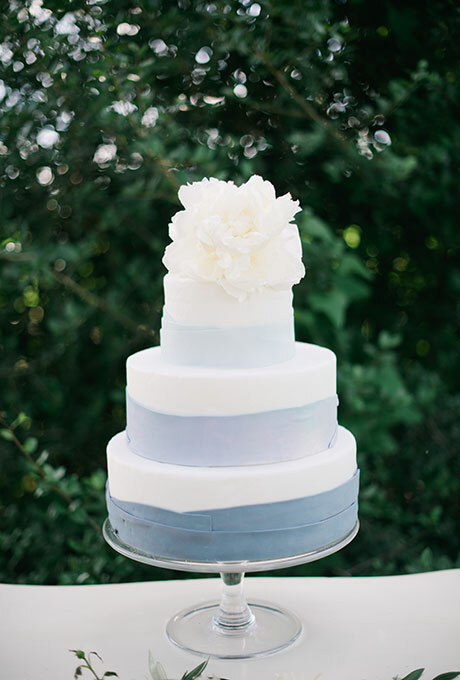 This cake would be lovely at a late winter/early spring wedding – the color are absolutely perfect for this time of year. It really has a timeless elegance. You can find this cake here. It was created by Buttercup Bakery Houston.